Lightcliffe were involved in the Bradford League’s first tie of the season yesterday at Morley. They needed two from the last ball at Scatcherd Lane but Mark Horne was run out coming back for a second. The visitors were left kicking themselves for having let their hosts off the hook earlier in the day. Morley were 48 for six before wicketkeeper Luke Heinemman (77) and experienced Colin Nuthall (43) helped their side recover to 173. Jonathan Whiteoak took six for 33 and overseas player Suleman Khan three for 30. A typically patient 41 from Chris Taylor helped the visitors on their way and Rhys Jowett (35) and Ian Philliskirk (31) also chipped in but Lightcliffe were unable to get over the line. Brighouse continue to be winless in Championship B after losing by 36 runs at home to Gomersal. The visitors’ 217 for seven, which included 63 from Adam Greenwood, proved out of reach as they replied with 181 for nine. Northowram Fields produced a poor batting display at home to Buttershaw St Paul’s in the Conference. The Rams were dismissed for 82, skipper John Lister top scoring with 36 as left-arm spinner Ben Platt picked up six for 24. Josh Bennett Keer took three for 26 but the visitors won by six wickets. Elliott Gilford and Graham Lalor answered Todmorden’s prayers on a trip to Church in the Lancashire League. The visitors picked up their second win of the season by a handsome 101-run margin. Gilford hit an unbeaten 94 off 106 balls in Todmorden’s 213 for eight with four sixes and two fours. Close-season recruit Lalor then took six for 40 and professional Ashton Turner three for 23 to dismiss the hosts for 112. 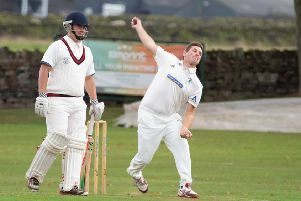 A captain’s knock from Darren Robinson helped Barkisland win by 11 runs at Cawthorne in the Huddersfield League. Robinson, batting at six, hit 72 and he received great support from number 10 Phil Ackroyd (32 no), the pair leaving Cawthorne requiring a round 200 for success. Barkisland kept chipping away at the home order, with spinner Matthew Steers taking four wickets, and the pressure told as the home side ran out of overs. An unbeaten century from Robin Broom was in vain as Elland lost by six wickets at home to Shepley. Nasir Jamal struck four early blows but Broom made 102 not out and Harish Krishnesh hit 30 as the Hullen Edge side totalled 182 for seven. However, Shepley surged to a six-wicket win in the 32nd over with 73 not out from Daniel Anderson. Illingworth lost by five wickets at home to Thackley in Division Two of the Aire/Wharfe League. Matt Smith hit 65 to help them to 198, Andrew Parratt taking give for 43. However, the home attack had limited success, Josh Brooksbank making 63 not out to finish matters with seven overs left.